This article is about the musical term. For other uses, see Antiphon (disambiguation). The Liber responsorialis, showing on the right-hand page the antiphons for the first night office of Christmas. The associated psalm tones are indicated by number and ending pitch, and the pitches for the ending of the doxology are indicated by vowels:et in secula seculorum amen. An antiphon (Greek ἀντίφωνον, ἀντί "opposite" and φωνή "voice") is a short chant in Christian ritual, sung as a refrain. The texts of antiphons are the Psalms. 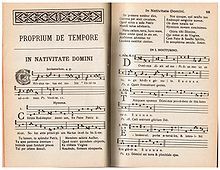 Their form was favored by St Ambrose and they feature prominently in Ambrosian chant, but they are used widely in Gregorian chant as well. They may be used during Mass, for the Introit, the Offertory or the Communion. They may also be used in the Liturgy of the Hours, typically for Lauds or Vespers. They should not be confused with Marian antiphons or processional antiphons. When a chant consists of alternating verses (usually sung by a cantor) and responds (usually sung by the congregation), a refrain is needed. The looser term antiphony is generally used for any call and response style of singing, such as the kirtan or the sea shanty and other work songs, and songs and worship in African and African-American culture. Antiphonal music is that performed by two choirs in interaction, often singing alternate musical phrases. Antiphonal psalmody is the singing or musical playing of psalms by alternating groups of performers. The term “antiphony” can also refer to a choir-book containing antiphons. The 'mirror' structure of Hebrew psalms renders it probable that the antiphonal method was present in the services of the ancient Israelites. According to historian Socrates of Constantinople, antiphony was introduced into Christian worship by Ignatius of Antioch (died 107), who saw a vision of two choirs of angels. Antiphons have remained an integral part of the worship in the Byzantine and Armenian Rite. The practice did not become part of the Latin Church until more than two centuries later. Ambrose and Gregory the Great, who are known for their contributions to the formulation of Gregorian chant, are credited with 'antiphonaries', collections of works suitable for antiphon, which are still used in the Roman Catholic Church today. Polyphonic Marian antiphons emerged in England in the 14th century as settings of texts honouring the Virgin Mary, which were sung separately from the mass and office, often after Compline. Towards the end of the 15th century, English composers produced expanded settings up to nine parts, with increasing complexity and vocal range. The largest collection of such antiphons is the late-15th-century Eton Choirbook. As a result, antiphony remains particularly common in the Anglican musical tradition: the singers often face each other, placed in the quire's Decani and Cantoris. The Greater Advent or O Antiphons are antiphons used at daily prayer in the evenings of the last days of Advent in various liturgical Christian traditions. Each antiphon is a name of Christ, one of his attributes mentioned in Scripture. In the Roman Catholic tradition, they are sung or recited at Vespers from December 17 to December 23. In the Church of England they have traditionally been used as antiphons to the Magnificat at Evening Prayer. More recently they have found a place in primary liturgical documents throughout the Anglican Communion, including the Church of England's Common Worship liturgy. Use of the O Antiphons was preserved in Lutheranism at the German Reformation, and they continue to be sung in Lutheran churches. When two or more groups of singers sing in alternation, the style of music can also be called polychoral. Specifically, this term is usually applied to music of the late Renaissance and early Baroque periods. Polychoral techniques are a definitive characteristic of the music of the Venetian school, exemplified by the works of Giovanni Gabrieli: this music is often known as the Venetian polychoral style. The Venetian polychoral style was an important innovation of the late Renaissance. This style, with its variations as it spread across Europe after 1600, helped to define the beginning of the Baroque era. Polychoral music was not limited to Italy in the Renaissance; it was also popular in Spain and Germany. There are examples from the 19th and 20th centuries, from composers as diverse as Hector Berlioz, Igor Stravinsky, Béla Bartók, and Karlheinz Stockhausen. Latin church music by George Frideric Handel — includes three antiphons. ^ E. Foley and M. Paul, Worship music: a concise dictionary (Liturgical Press, 2000), p. 18. ^ J. McKinnon, Music in early Christian literature (Cambridge University Press, 1989), p. 10. ^ A.C. Zenos, ed., 'The Ecclesiastical History of Socrates Scholasticus,' book VI, chapter VIII, vol 2, p 144. In A Select Library of Nicene and Post-Nicene Fathers of the Christian Church, Second Series, P. Schaff and H. Wace, eds (Grand Rapids: W. B. Eerdmans Publishing Company, 1957). Herbermann, Charles, ed. (1913). "Antiphon (in Greek Liturgy)" . Catholic Encyclopedia. New York: Robert Appleton Company. ^ G. Wainwright, K. B. W. Tucker. The Oxford History of Christian Worship (Oxford University Press, 2006), p. 244. ^ a b R. H. Fritze and W. Baxter Robison, Historical Dictionary of Late Medieval England, 1272–1485 (Greenwood, 2002), p. 363. ^ H. Benham, John Taverner: His Life and Music (Ashgate, Aldershot, 2003), pp. 48–9. ^ R. Bray, 'England i, 1485–1600' in J. Haar, European Music, 1520–1640 (Boydell, 2006), p. 498. ^ A. Nocent and M. J. O'Connell, The Liturgical Year (Liturgical Press, 1977), p. 162. ^ A. Nocent and M. J. O'Connell (1977), Liturgical Year, pp. 163-80. ^ J. H. Blunt, The Annotated Book of Common Prayer: Being an Historical, Ritual, and Theological Commentary on the Devotional System of the Church of England (Rivingtons, 1866), p. 76. ^ C. B. Brown, Singing the Gospel: Lutheran Hymns and the Success of the Reformation (Harvard University Press, 2005), p. 61. ^ C. Parrish, A Treasury of Early Music: Masterworks of the Middle Ages, the Renaissance and the Baroque Era (Courier Dover Publications, 2000), p. 138. ^ Grove Dictionary of Music and Musicians, Oxford University Press.